The chemokine receptor CXCR3 is highly expressed on Th1 polarized T cells and has been predicted to play an important role in T cell recruitment and immune response in a number of inflammatory and autoimmune diseases. For testing whether CXCR3 plays a role in renal inflammation, CXCR3-deficient mice were generated and nephrotoxic nephritis was induced in C57BL/6 CXCR3−/− and C57BL/6 wild-type mice. Induction of the nephrotoxic nephritis leads to an increased renal mRNA expression of IP-10/CXCL10 (8.6-fold), Mig/CXCL9 (2.3-fold), and I-TAC/CXCL11 (4.9-fold) during the autologous phase at days 7 and 14. This increased chemokine expression was paralleled by the renal infiltration of T cells, followed by renal tissue injury, albuminuria, and loss of renal function. Compared with wild-type mice, CXCR3-deficient mice had significantly reduced renal T cell infiltrates. Moreover, CXCR3−/− mice developed less severe nephritis, with significantly lower albuminuria, better renal function, and a reduced frequency of glomerular crescent formation. 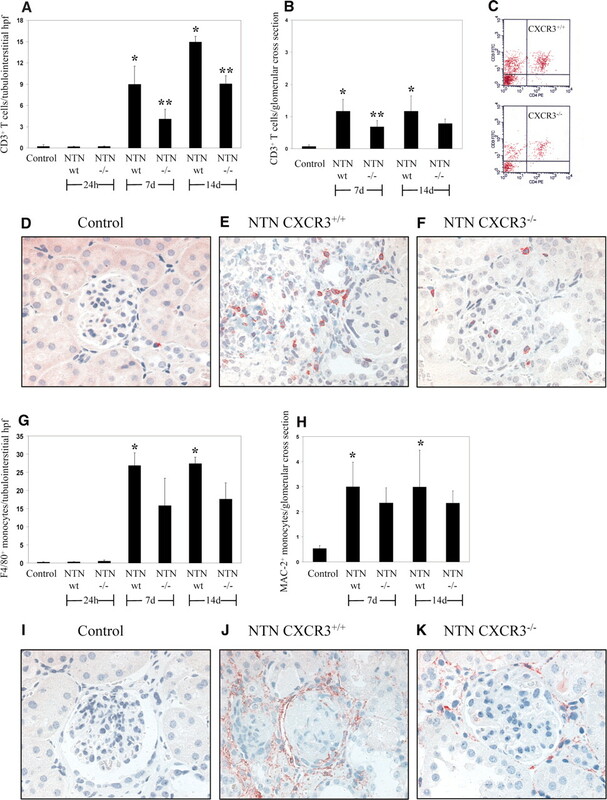 Nephritic wild-type and CXCR3−/− mice both elicited an efficient systemic nephritogenic immune response in terms of antigen-specific IgG production and IFN-γ expression by splenocytes in response to the nephritogenic antigen. These findings indicate that the ameliorated nephritis in CXCR3-deficient mice is due to impaired renal trafficking of effector T cells rather than their inability to mount an efficient humoral or cellular immune response. The neutralization of CXCR3 might be a promising therapeutic strategy for Th1-dependent inflammatory renal disease. Recent studies have established an important role of chemokines and their specific receptors in the regulation of leukocyte migration in renal inflammatory disease.7–11 However, the precise molecular basis for the directional migration of effector T cells in glomerulonephritis is not defined. In this study, we generated CXCR3-deficient mice to investigate the functional role of CXCR3 in the kidney under homeostatic and pathologic conditions. Nephrotoxic nephritis (NTN) was induced to analyze the molecular mechanisms of T cell recruitment in glomerulonephritis by CXCR3 and its three ligands, IP-10/CXCL10, Mig/CXCL9, and I-TAC/CXCL11, and to identify potential novel targets for therapeutic interventions. CXCR3-deficient mice were generated using the targeting strategy outlined in Figure 1A. Deletion of the CXCR3 gene in embryonic stem (ES) cells was verified by Southern blot analysis (Figure 1B). A PCR strategy that allowed the wild-type and knockout allele to be distinguished was established (Figure 1C). CXCR3-deficient mice were viable, were fertile, and showed no obvious developmental abnormalities in comparison with wild-type C57BL/6 mice (data not shown). Flow cytometric analysis of peripheral blood for T cell subsets (CD3, CD4, and CD8), B cells (B220), and NK cells (NK1.1) revealed no differences between CXCR3+/+ and CXCR3−/− mice (data not shown). Generation of CXCR3-deficient mice. (A) Targeting strategy for the generation of the constitutive knockout of the Cxcr3 gene in mice. In embryonic stem (ES) cells, the homologous recombination of the targeting vector pKO-Cxcr3 led to a deletion of exon 2. Relevant restriction sites (A, ApaI; E, EcoRI; K, KpnI; S, SalI; X, XbaI) and localization of probes for Southern blot analysis are shown (5′BamH1 and 3′Spel). (B) Southern blot analysis for 5′ and 3′ homologous recombination. The genomic DNA of the clones 2A4 and 3C5 were compared with wild-type (WT) DNA. The correct targeting event in both ES cell clones leads to the expected band shift. (C) PCR genotyping of generated mice: The top panel represents the WT and the mutated Cxcr3 gene locus. The bottom panel shows examples of the genotyping PCR for CXCR3 homozygous, heterozygous, and WT mice. In the next step, we addressed whether the CXCR3 gene targeting strategy described resulted in the lack of CXCR3 mRNA and protein expression. CXCR3-specific mRNA was not detectable by real-time reverse transcription–PCR analysis from spleen cells in CXCR3−/− mice. In contrast, spleen cells from wild-type and heterozygous mice expressed CXCR3 mRNA (Figure 2A). Identification of the CXCR3 gene knockout in mice. (A) Real-time reverse transcription–PCR (RT-PCR) amplification curve from spleen cells of CXCR3+/+ (red), CXCR3+/− (green), and CXCR3−/− (blue) mice for CXCR3 and 18S as housekeeping gene. (B) CXCR3 flow cytometric analysis of isolated spleen T cells from CXCR3+/+ and CXCR3−/− mice. (C) Chemotaxis analysis of T cells that were isolated from the spleen of CXCR3+/+ and CXCR3−/− mice toward IP-10/CXCL10 (representative results of three independent experiments are shown). Flow cytometry experiments using an anti-mouse CXCR3 antibody revealed the absence of CXCR3 protein on CD3+ T cells that were isolated from the spleen of CXCR3−/− mice, whereas in CXCR3 wild-type mice, approximately 40% of CD3 cells were CXCR3 positive (Figure 2B). To show that the lack of CXCR3 mRNA and protein production results in a loss of function in CXCR3-deficient mice, we performed chemotactic assay experiments. Splenic T cells from CXCR3−/− and wild-type mice were isolated, and the chemotactic response toward the CXCR3-specific ligand IP-10/CXCL10 was assessed in a modified Boyden chamber. Wild-type T cells showed a dosage-dependent responsiveness to IP-10/CXCL10 with a maximum at 100 nM. CXCR3−/− T cells did not respond to IP-10/CXCL10 above the basal migration rate (Figure 2C). Because recent reports suggested an important function of CXCR3 and its ligand IP-10/CXCL10 in maintaining slit diaphragm function by regulating podocyte cell-cycle balance,17,18 we examined the renal phenotype of CXCR3-deficient mice under normal homeostatic conditions. For this purpose, we used 12-mo-old male CXCR3−/− (n = 8) and wild-type (n = 8) mice. No histologic differences between the knockout and wild-type groups were observed in the glomerulus and the tubulointerstitium (Figure 3A). To analyze possible minimal morphologic abnormalities in the glomerular filtration barrier, we performed electron microscopy. As shown in Figure 3B, no pathologic findings were detectable in both groups in terms of glomerular basement membrane morphology, endothelial cell structure, and podocyte foot process morphology. Characterization of the renal phenotype of CXCR3-deficient mice. Renal phenotype and function of 12-mo-old CXCR3+/+ (n = 8) and CXCR3−/− mice (n = 8) were not different between WT and CXCR3-deficient mice. (B) Electron microscopy (C) Serum creatinine level. (D) Blood urea nitrogen (BUN) level. (E) Albuminuria level. Magnifications: ×200 and ×400 in A (periodic acid-Schiff staining); ×7000 in B.
Functional analysis of CXCR3-deficient and wild-type mice demonstrated identical serum creatinine (Figure 3C) and urea levels (Figure 3D). Furthermore, CXCR3−/− mice and wild-type mice had comparable urinary albumin concentrations <20 μg/ml (Figure 3E). NTN was induced in wild-type and CXCR3−/− mice by intraperitoneal injection of sheep nephrotoxic serum as described in the Materials and Methods section. Renal sheep IgG binding was predominantly detectable in the glomerulus and to a lesser degree in the tubulointerstitium of nephritic wild-type (Figure 4B) and CXCR3−/− mice (Figure 4C) but not in the control group (Figure 4A) at 24 h. At day 7, renal deposition of secondary mouse IgG was comparable in nephritic wild-type (Figure 4E) and nephritic CXCR3-deficient mice (Figure 4F). Control mice did not reveal significant mouse IgG deposition (Figure 4D). Immunohistochemical staining for C3 showed equal distribution in nephritic wild-type mice (Figure 4H) and nephritic CXCR3-deficient mice (Figure 4I) at day 7, whereas in the control group, only background staining was detectable (Figure 4G). Nephrotoxic nephritis (NTN) induction in CXCR3+/+ and CXCR3−/− mice. (A through C) Immunohistochemical staining of sheep IgG in control mice (A), nephritic WT mice (B), and nephritic CXCR3-deficient mice (C) 24 h after induction of the disease. (D through F) Renal deposition of secondary mouse IgG in control mice (D), CXCR3+/+ mice (E), and CXCR3−/− mice (F) 7 d after nephritis induction. C3 staining of control (G), nephritic WT (H), and nephritic CXCR3-deficient mice (I)at day 7 (representative results of four independent experiments are shown). Magnification, ×400. Intrarenal mRNA expression of IP-10/CXCL10, Mig/CXCL9, and I-TAC/CXCL11 was significantly higher after nephritis induction compared with the control group during the autologous phase at 7 and 14 d (7 d: IP-10/CXCL10 8.6-fold, Mig/CXCL9 2.3-fold, I-TAC/CXCL11 4.9-fold; 14 d: IP-10/CXCL10 4.8-fold, Mig/CXCL9 2.6-fold, I-TAC/CXCL11 3.3-fold; P < 0.05 versus control; Figure 5). Analysis of CXCR3 mRNA expression revealed a renal upregulation after nephritis induction during the autologous phase in comparison with the control group (7 d: CXCR3 2.9-fold; 14 d CXCR3 five-fold; P < 0.05 versus control). In CXCR3-deficient mice, no renal CXCR3 mRNA expression was detectable after nephritis induction (Figure 4). 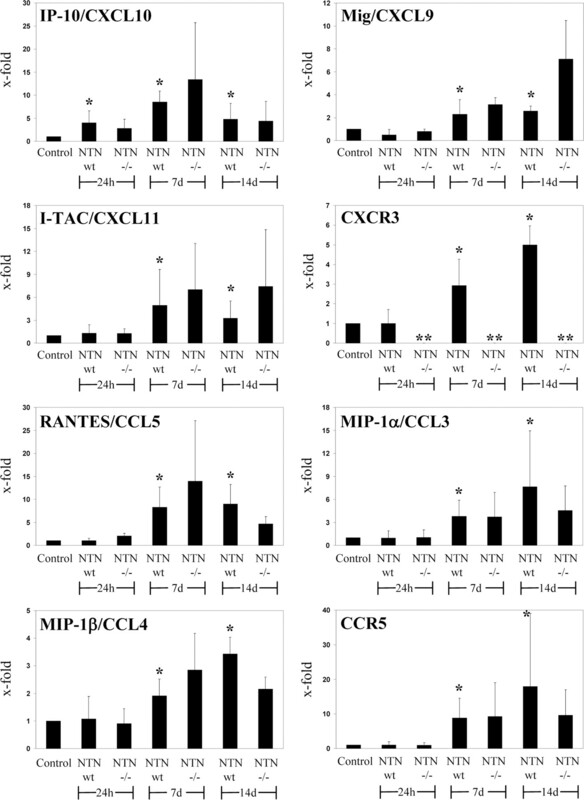 Renal mRNA expression of CCR5 (7 d: CCR5 8.8-fold; 14 d CCR5 17.9-fold; P < 0.05 versus control) and its ligands RANTES/CCL5, MIP-1α/CCL3, and MIP-1β/CCL4 were also enhanced during the autologous phase of the nephritis at days 7 and 14 (7 d: RANTES/CCL5 8.3-fold, MIP-1α/CCL3 3.8-fold, MIP-1β/CCL4 1.9-fold; 14 d: RANTES/CCL5 ninefold, MIP-1α/CCL3 7.6-fold, MIP-1β/CCL4 3.4-fold; P < 0.05 versus control). Except for CXCR3, no significant differences in renal chemokine mRNA expression between nephritic wild-type C57BL/6 and CXCR3-deficient C57BL/6 mice were detectable. Chemokine expression in the NTN in mice. Relative intrarenal mRNA expression of chemokines and chemokine receptors as examined by real-time RT-PCR at 24 h and 7 and 14 d in CXCR3-deficient (−/−) and WT mice after the induction of NTN (x-fold of the control group; n = 4 to 5 for each group and time point). *P < 0.05 versus control; **P < 0.05 versus CXCR3+/+ nephritic mice. During the early T cell–independent heterologous phase of the nephritis at 24 h, only IP-10/CXCL10 mRNA formation was slightly upregulated, whereas expression of all other analyzed T cell–attracting chemokines and their receptors were not induced when compared with control mice (Figure 5). Immunohistochemical CD3 staining revealed a significant increase in T cell infiltration during the autologous phase at days 7 and 14 after NTN induction in wild-type mice when compared with healthy controls. CXCR3-deficient mice had significantly less tubulointerstitial T cell infiltrates when compared with wild-type mice at 7 and 14 d (7 d: NTN 9.0 ± 2.5 cells/high-power field [hpf] versus NTN CXCR3−/− 4.1 ± 1.4 cells/hpf [P < 0.05]; 14 d: NTN 14.9 ± 0.8 cells/hpf versus NTN CXCR3−/− 9.1 ± 1.1 cells/hpf [P < 0.05]; Figure 6A). No significant renal T cell migration was detectable during the heterologous phase of the nephritis at 24 h. This finding is in accordance with the renal chemokine expression data that showed that only the T cell attractant chemokine IP-10/CXCL10 was slightly upregulated at 24 h after NTN induction (Figure 5). Only very few T cells were detectable per glomerular cross-section (gcs; Figure 6B). However, at day 7, glomerular T cell infiltration was significantly reduced in CXCR3-deficient mice when compared with nephritic wild-type mice (7 d: NTN 1.2 ± 0.4 cells/gcs versus NTN CXCR3−/− 0.7 ± 0.2 cells/gcs; P < 0.05; Figure 6B). Renal T cell and monocyte recruitment. Quantification of tubulointerstitial (A) and glomerular CD3+ T cell recruitment (B). Representative flow cytometric analysis of CD3+ and CD4+ T cell infiltration from renal single-cell suspensions of nephritic CXCR3 WT and CXCR3-deficient mice (C) at day 14. Representative CD3 staining of a control (D), nephritic CXCR3 wild-type (E), and CXCR3-deficient mice (F) at 14 d. Quantification of tubulointerstitial F4/80-positive monocyte recruitment (G) and glomerular MAC-2 positive monocyte infiltration (H). Representative F4/80 staining in control (I), CXCR3+/+ (J), and CXCR3−/− mice (K) 14 d after nephritis induction. Data are given as means of 30 high-power fields (hpf) ± SD or as means of 50 glomerular cross-sections ± SD (n = 4 to 5 for each group and time point). *P < 0.01 versus control; **P < 0.05 versus nephritic CXCR3+/+ mice. Magnification, ×400. Flow cytometric analysis of renal single-cell suspensions from nephritic mice confirmed the immunohistochemically observed reduced T cell recruitment in CXCR3−/− mice. The percentage of renal CD3+ T cells per 100,000 gated events was approximately 1.7-fold increased in CXCR3 wild-type mice as compared with CXCR3-deficient mice (Figure 6C) 14 d after NTN induction (NTN 3.3%; CXCR3−/− NTN 1.9%). Representative immunohistochemical staining against CD3 of control mice (Figure 6D), nephritic CXCR3 wild-type mice (Figure 6E), and nephritic CXCR3-deficient mice (Figure 6F) is shown 14 d after disease induction. Extensive tubulointerstitial and periglomerular T cell infiltrates were detectable in CXCR3 wild-type (Figure 6E) compared with CXCR3-deficient mice. The compartment-specific monocyte infiltration was analyzed by quantification of tubulointerstitial F4/80+ and glomerular MAC-2+ monocytes. Two different immunohistochemical stainings (F4/80 and MAC-2) were performed because F4/80 is well suited for monocyte detection in the tubulointerstitium but not in glomeruli. In contrast, MAC-2 is more sensitive for detection of glomerular monocytes but not as specific for monocytes in the tubulointerstitial compartment. The induction of nephritis resulted in a significant increase of tubulointerstitial (Figure 6G) and glomerular (Figure 6H) monocyte recruitment in CXCR3 wild-type and CXCR3-deficient mice on days 7 and 14. Although there seems to be a decrease of infiltrating tubulointerstitial (control 0.3 ± 0.2 cells/hpf; 7 d: NTN 26.9 ± 3.5 cells/hpf versus NTN CXCR3−/− 15.8 ± 7.5 cells/hpf [NS]; 14 d: NTN 27.4 ± 1.8 cells/hpf versus NTN CXCR3−/− 17.6 ± 4.5 cells/hpf [NS]; Figure 6G) and glomerular (control 0.5 ± 0.1 cells/gcs; 7 d: NTN 3.0 ± 1.0 cells/gcs versus NTN CXCR3−/− 2.4 ± 0.6 cells/gcs [NS]; 14 d: NTN 3.0 ± 1.5 cells/gcs versus NTN CXCR3−/− 2.3 ± 0.5 cells/gcs [NS]; Figure 6H) monocytes in CXCR3-deficient mice when compared with wild-type mice, the decrease was NS. The majority of infiltrating monocytes localized to the tubulointerstitial and periglomerular region as demonstrated by a representative F4/80 staining of nephritic wild-type (Figure 6I) and nephritic CXCR3−/− mice (Figure 6J). The number of renal monocytes in control mice was low (Figure 6, G and H). Kidneys of nephritic wild-type mice showed severe glomerular and tubulointerstitial damage with massive renal mononuclear cell recruitment during the autologous phase of the disease (days 7 and 14). However, consistent with a decreased number of infiltrating T cells, the severity of renal damage was significantly reduced in nephritic CXCR3-deficient mice as compared with nephritic wild-type mice. Histologic analysis revealed less glomerular crescent formation in CXCR3−/− mice 7 and 14 d after NTN induction (7 d: NTN 31.4 ± 3.8% versus NTN CXCR3−/− 12.4 ± 6.2% [P < 0.05]; 14 d: NTN 50.5 ± 3.3% versus NTN CXCR3−/− 20.4 ± 5.4% [P < 0.05] Figure 7A). In addition, at 14-d segmental glomerular sclerosis (<50%) was observed in 50.1% of CXCR3−/− versus 82.3% in CXCR3 wild-type mice at 14 d (P < 0.05; Figure 7B). Complete glomerular sclerosis (≥50%) was also reduced in CXCR3-deficient mice (14 d: NTN 52.5 ± 4.8% versus NTN CXCR3−/− 19.6 ± 11.3%; P < 0.05; Figure 7C). CXCR3−/− mice show less histologic injury than CXCR3+/+ mice. CXCR3-deficient mice show less severe histologic injury in comparison with CXCR3 WT mice, as reflected by quantitative assessment of glomerular crescent formation (A), percentage of glomeruli with sclerosis (B), and percentage of glomeruli with severe glomerular sclerosis (≥50%; C). Representative histopathology of kidneys from CXCR3+/+ and CXCR3−/− at day 14 after NTN: In CXCR3 WT mice, most glomeruli showed extensive glomerulosclerosis with crescent formation and severe tubulointerstitial damage (D), whereas CXCR3-deficient mice showed significantly less glomerulosclerosis and infrequent glomerular crescent formation (E) (n = 4 to 5 for each group and time point). *P < 0.01 versus control; **P < 0.05 versus nephritic CXCR3+/+ mice. Magnification, ×400. Representative periodic acid-Schiff staining of nephritic mice 14 d after induction of the disease shows severe glomerulosclerosis with crescent formation and tubulointerstitial damage in wild-type mice (Figure 7D), whereas CXCR3-deficient nephritic mice showed significantly less glomerulosclerosis and infrequent glomerular crescent formation (Figure 7E). Induction of NTN leads to significantly increased serum creatinine (control: 0.24 ± 0.03 mg/dl; NTN 7 d: 0.71 ± 0.75 mg/dl; NTN 14 d: 0.41 ± 0.07; P < 0.01 versus control) and blood urea nitrogen (BUN; control: 30.8 ± 7.9 mg/dl; NTN 7 d: 75.1 ± 19.3 mg/dl; NTN 14 d: 70.3 ± 15.7; P < 0.01 versus control; Figure 8, A and B) levels after 7 and 14 d. At day 14, serum creatinine and BUN levels were significantly lower in nephritic CXCR3−/− mice in comparison with CXCR3+/+ mice (serum creatinine CXCR3−/− NTN 14 d: 0.28 ± 0.02 mg/dl; BUN CXCR3−/− NTN 14 d: 48.3 ± 5.1; P < 0.05 versus NTN), whereas after 24 h, no significant difference was observed (Figure 8, A and B). CXCR3−/− mice develop less renal impairment than CXCR3+/+ mice in NTN. Renal dysfunction in nephritic mice was assessed by serum creatinine level (A), BUN level (B), and albuminuria (C) in CXCR3+/+ and CXCR3−/− mice (n = 4 to 5 for each group and time point). *P < 0.01 versus control; ** P < 0.05 versus nephritic CXCR3+/+ mice. All nephritic wild-type and CXCR3-deficient mice developed significant albuminuria at 24 h and 7 and 14 d (Figure 8C). There was no difference in albuminuria during the heterologous phase at 24 h between CXCR3−/− and wild-type mice (data not shown). However, during the autologous phase at days 7 and 14 after nephritis induction, CXCR3-deficient mice had reduced albuminuria in comparison with wild-type mice (albuminuria NTN 7 d: 20.8 ± 13.0 mg/ml; NTN 14 d: 13.2 ± 3.9 mg/ml; CXCR3−/− NTN 7 d: 3.5 ± 2.7 mg/ml; CXCR3−/− NTN 14 d: 2.3 ± 2.9 mg/ml; P < 0.05 versus NTN; Figure 8C). To analyze whether the lack of CXCR3 affects the cellular immune response, we assessed the Th1 (IFN-γ and TNF-α) and Th2 (IL-4) cytokine mRNA expression of CXCR3−/− and CXCR3+/+ in the kidneys during the heterologous phase (24 h) and the autologous phase (8 d) after nephritis induction. Renal IFN-γ and TNF-α expression was significantly upregulated (IFN-γ 7.8-fold; TNF-α 8.3-fold) in nephritic wild-type mice during the autologous but not in the early T cell–independent heterologous period of the nephritis in comparison with the control group (Figure 9). It is interesting that CXCR3-deficient mice had significantly reduced renal IFN-γ levels compared with wild-type mice 8 d after induction of the disease. The renal IL-4 mRNA expression was below the sensitivity level of the real-time PCR in all groups (data not shown). Th1 immune response. Renal IFN-γ and TNF-α mRNA expression as assessed by real-time RT-PCR at 24 h and 8 d after the induction of NTN (x-fold of the control group; n = 5 for each group and time point). *P < 0.01 versus control; **P < 0.05 versus nephritic CXCR3+/+ mice. To analyze the systemic humoral immune response in nephritic wild-type and CXCR3-deficient mice on day 8, we assessed antigen-specific total mouse anti-sheep IgG and antigen-specific IgG subtypes (IgG1, IgG2a, and IgG2b) serum by specific ELISA. Total mouse anti-sheep globulin IgG levels were similar in both groups (Figure 10A), indicating that CXCR3 is not required for the development of humoral immunity. Although IgG1 (Figure 10B) and IgG2b (Figure 10D) titers were comparable in both groups, there was an NS tendency for higher titers of IgG2a in CXCR3−/− nephritic mice (Figure 10C). Systemic antigen-specific immune responses. Circulating titers of mouse anti-sheep total IgG (A), IgG1 isotype (B), IgG2a isotype (C), and IgG2b isotype (D) 8 d after nephritis induction were measured by ELISA in control +/+ mice (n = 6), control CXCR3−/− mice (n = 3), nephritic CXCR3+/+ (n = 8), and nephritic CXCR3−/− mice (n = 5). Serum dilutions were 1:100 to 1:12,500 for total IgG, 1:100 for IgG1, 1:100 for IgG2a, and 1:100 for IgG2b. *P < 0.01 versus control. 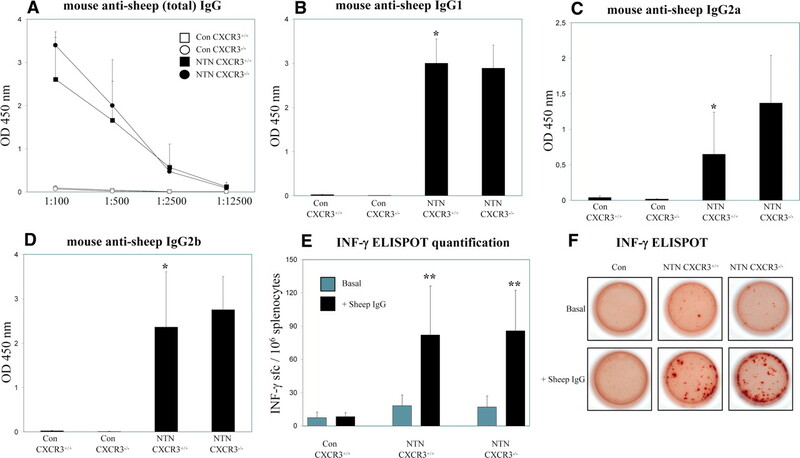 (E) The frequency of IFN-γ–producing splenocytes was assessed by mouse-specific IFN-γ enzyme-linked immunosorbent spot (ELISPOT) in control mice and nephritic WT and nephritic CXCR3-deficient mice 8 d after induction of the disease in response to sheep IgG. Data are expressed as IFN-γ spot-forming cells (sfc)/106 splenocytes. *P < 0.01 versus control; ** P < 0.05 versus basal condition (n = 4 for each group). (F) Representative examples of the IFN-γ ELISPOT experiments. To examine the effect of CXCR3 on the cellular immune response, we assessed the in vitro frequency of IFN-γ–producing splenocytes by enzyme-linked immunosorbent spot (ELISPOT) 8 d after nephritis induction. IFN-γ spot-forming splenocytes from nephritic wild-type and nephritic CXCR3-deficient mice were significantly higher upon in vitro stimulation with sheep IgG when compared with unstimulated basal condition (Figure 10E). No significant differences between nephritic wild-type and nephritic CXCR3−/− mice were detectable. Representative IFN-γ ELISPOT of splenocytes from control mice, nephritic wild-type mice, and nephritic CXCR3-deficient mice under basal conditions and upon stimulation with sheep IgG (20 μg/ml) are shown in Figure 10F. CXCR3 is a chemokine receptor that is preferentially expressed on the surface of Th1 T cells. The receptor is activated by three related chemokines: IP-10/CXCL10, Mig/CXCL9, and I-TAC/CXCL11.19,20 Each of these ligands is induced by IFN-γ and is produced in Th1-type immune responses. CXCR3 has been localized to infiltrating effector T cells of the Th1 type in a wide variety of human inflammatory diseases, including renal transplant rejection,21,22 glomerulonephritis,12 rheumatoid arthritis,23 and multiple sclerosis.24 The CXCR3 ligands have been shown to be expressed in an overlapping pattern with CXCR3 bearing Th1 cells in these diseases.12,21,23,24 Therefore, this receptor-ligand system is thought to play a central role in the recruitment of effector T cells into the affected tissue, resulting in T cell–mediated inflammation. The functional importance of the CXCR3 receptor in T cell–mediated inflammation is further supported by experimental data. CXCR3-deficient mice were protected from heart allograft transplant rejection, autoimmune type 1 diabetes, and acute renal ischemic injury in murine models.25–27 In addition, IP-10/CXCL10 neutralization approaches using IP-10/CXCL10-deficient mice and neutralizing antibodies were similarly shown to exert a protective role in some of these animal models28 as well as in a rat model of renal endothelial microvascular injury.14 Taken together, these data support a central role for both CXCR3 and its ligands in T cell–mediated inflammation. Inflammatory cells at the site of tissue injury are a hallmark of human and experimental glomerulonephritis. Infiltrating leukocytes mediate the initiation and progression of renal tissue injury by direct cytotoxicity, the secretion of soluble mediators, or direct regulation of the immune response. They probably also play a major role in tissue repair. Particularly, T cells and monocytes contribute to the development of renal tissue injury.2 Whereas the molecular mechanisms that lead to infiltration of monocytes have been extensively studied, those that lead to renal T cell recruitment are still not well characterized. It was shown by Holdsworth's group that the development of crescentic nephritis in mice is a result of a cell-mediated Th1 immune response.29,30 In addition, Johnson hypothesized that an imbalance in the Th1/Th2 immune response might be responsible for the development of human glomerulonephritis.31 We therefore hypothesized that renal expression of CXCR3-binding chemokines might induce the recruitment of CXCR3-positive effector T cells and thereby mediate renal tissue injury in the T cell–dependent model of NTN. In a first step, we analyzed the renal chemokine and chemokine receptor expression in nephritic mice. In agreement with published studies,32,33 we found an upregulation of the CXCR3 ligand IP-10/CXCL10 mRNA in the autologous phase of the nephritis with a maximum at day 7. ELISA experiments revealed that renal mRNA formation was paralleled by a 40-fold increase in urinary IP-10/CXCL10 protein excretion in nephritic mice at day 7 in comparison with control mice (data not shown). In addition, we detected an enhanced renal mRNA expression of the other CXCR3 ligands Mig/CXCL9 and I-TAC/CXCL11. Upregulation of chemokine expression was accompanied by infiltration of T cells predominantly into the tubulointerstitial and periglomerular area of the inflamed kidneys. To examine the functional role of CXCR3 in this model, we developed CXCR3-deficient mice and compared in −/− and +/+ renal T cell recruitment. We found a significantly reduced T cell infiltration in CXCR3-deficient mice during the autologous phase (days 7 and 14) of NTN. The effect of CXCR3 deficiency on tubulointerstitial T cell recruitment was incomplete, suggesting that other chemokine receptors and chemotactic factors are of functional relevance. In fact, we could detect an enhanced expression of the CCR5 ligands MIP-1α/CCL3, MIP-1β/CCL4, and RANTES/CCL5 in mRNA preparation from whole-kidney lysates from mice during the autologous phase of the nephritis. Because CCR5 is highly expressed on T cells, these chemokines could also participate in the T cell recruitment. However, we could clearly show the functional relevance of the CXCR3. Consistent with the reduced T cell infiltration, CXCR3-deficient C57BL/6 mice developed less severe NTN than C57BL/6 wild-type mice in terms of renal function, albuminuria, and histologic injury (including glomerular crescent formation and sclerosis). We found an upregulated renal IFN-γ mRNA expression during the autologous phase of the NTN. It is interesting that CXCR3-deficient mice had significantly reduced IFN-γ expression in comparison with nephritic wild-type mice at day 7, which might reflect the impaired renal trafficking of Th1 polarized IFN-γ producing T cells. During the early heterologous phase of the NTN (at 24 h), which is thought to be mediated by antibodies, complement and neutrophils infiltrating the renal tissue injury, renal function were not different in CXCR3-deficient and wild-type mice. These data showed that the lack of CXCR3 is not protective during the T cell–independent period of the nephritis. Renal sheep IgG staining revealed an equal amount of glomerular and, although at a much lower level, tubulointerstitial antibody binding in nephritic CXCR3 wild-type mice and CXCR3 knockout mice at 24 h. Furthermore, there was no difference in deposition of secondary renal mouse IgG 7 d after nephritis induction in both groups. Assessment of systemic humoral and cellular immune response by measurement of mouse anti-sheep serum IgG titers and IFN-γ production of sheep IgG-stimulated spleen cells demonstrated that both nephritic CXCR3+/+ and CXCR3−/− mice produce an efficient immune response. Taken together, the data indicate that the decreased susceptibility of CXCR3−/− mice to develop NTN is due to impaired T cell trafficking into the inflamed kidney rather than their inability to elicit a systemic nephritogenic immune response. Han and colleagues17,18 postulated another potential function of CXCR3 in the kidney. They showed by immunohistochemistry and in vitro studies that CXCR3 and IP-10/CXCL10 are expressed by podocytes and to a lesser extent by mesangial cells under basal conditions and are upregulated in the rat model of anti–Thy-1 glomerulonephritis. Neutralization of IP-10/CXCL10 by a mAb resulted in an unfavorable disease course with exacerbation of proteinuria, mesangiolysis, and matrix expansion, suggesting an important function of the CXCR3/IP-10/CXCL10 axis in maintaining the intact glomerular filtration barrier.18 In contrast, we and other groups could not detect significant glomerular CXCR3 expression by immunohistochemistry under basal or inflammatory conditions.12,14,21 To address this point, we assessed the renal phenotype of 12-mo-old CXCR3-deficient mice in terms of histology, glomerular electron microscopy, albuminuria, serum creatinine, and urea nitrogen level. None of the analyzed parameters was different between CXCR3−/− and CXCR3 wild-type mice, strongly arguing against an important role of CXCR3 and its ligands in maintaining the glomerular filtration barrier under normal homeostatic conditions. C57BL/6 wild-type mice were purchased from Charles River (Sulzfeld, Germany). CXCR3-deficient mice were generated by our group as described next. All mice were raised in specific pathogen-free conditions. Animal experiments were performed according to national and institutional animal care and ethical guidelines and had been approved by local committees. The targeting vector pKO-Cxcr3 was constructed based on a cloned genomic DNA-fragment from a 129-mouse library. This 12-kb EcoRI fragment contained the entire CXCR3 coding region and surrounding intergenic regions. A replacement vector in which almost the entirety of exon 2 was replaced by the neomycin phosphotransferase gene (neo) was designed. Flanking the neo cassette, the targeting vector pKO-Crcr3 contained a 5′ and a 3′ homology region, which represent a total of 8.2 kb of homologous sequence. At the 3′ end of the targeting vector, a negative selection cassette (−) was attached. A more detailed description is available upon request. The linearized targeting construct pKO-Cxcr3 was electroporated into wild-type E14 ES cells, and clones that were resistant to G418 were picked and screened by Southern blot analysis. The results of the Southern blot analysis confirmed that ES cell clones 2A4 and 3C5 were correctly targeted both at the 5′ and at the 3′ end of the pKO-Cxcr3 construct. These two positive ES cell clones were injected into blastocysts that were derived from C57BL/6 mice. Successfully injected embryos were transferred into the uteri of pseudopregnant foster mothers. The resulting chimeric male mice were crossed with C57BL/6 female mice to investigate whether targeted ES cells contributed to the germ layer. Heterozygous female mice were identified within the resulting F1 generation, demonstrating that germ-line transmission of the X-chromosomal CXCR3 mutation had occurred. The resulting CXCR3+/− mice were backcrossed for seven generations into a pure C57BL/6 background to obtain male C57BL/6 CXCR3-deficient mice that were used for all experiments. NTN was induced in 10- to 12-wk-old male CXCR3-deficient and wild-type mice (22 to 26 g body weight) by intraperitoneal injection of 2.5 mg of nephrotoxic sheep serum per gram of mouse body weight as described previously.35 Controls were injected intraperitoneally with the same amount of normal sheep IgG. Mice were housed in metabolic cages for urine collection for 6 h the day before being killed. Urinary albuminuria was determined by standard ELISA analysis (Mice-Albumin Kit; Bethyl, Montgomery, TX). When the mice were killed, blood was drawn for creatinine and BUN measurement. Light microscopy and immunohistochemistry were performed by routine procedures as described previously.36 Glomerular sclerosis and crescent formation were assessed in 50 glomeruli per mouse in a blinded manner in periodic acid-Schiff–stained paraffin sections. Glomerular sclerosis was scored as no sclerosis, <50% sclerosis, or >50% sclerosis, and glomerular crescent formation was determined as described previously.37 Paraffin-embedded sections (2 μm) were stained with an antibody directed against the T cell marker CD3 (A0452; Dako, Hamburg, Germany), the monocyte-specific marker F4/80 (BM8; BMA, Hiddenhausen, Germany), a marker for glomerular monocytes MAC-2 (M3/38, Cedarlane Laboratories, Burlington, Ontario, Canada), C3 (Cappel Laboratories, Organon Teknika Corp., Durham, NC), and sheep IgG and mouse IgG (both Jackson ImmunoResearch Laboratories, Westgrove, PA). Tissue sections were developed with the Vectastain ABC-AP kit (Vector Laboratories, Burlingame, CA). F4/80+ and CD3+ cells in 50 gcs and 30 tubulointerstitial hpf per kidney were counted by light microscopy in a blinded manner. For electron microscopy, kidney tissue was fixed in 4% paraformaldehyde in 0.1 M cacodylate buffer, embedded in araldite, cut with an Ultracut E ultramicrotome (Reichert Jung, Wien, Austria), and stained with uranyl acetate and lead citrate. Specimens were examined with a Zeiss EM 109 electron microscope (Iena, Germany). Previously described methods for renal cell isolation from murine kidneys were used.38 In brief, kidneys were finely minced and digested for 45 min at 37°C with 0.4 mg/ml collagenase D (Roche, Mannheim, Germany) and 0.01 mg/ml DNAse I in DMEM (Roche) supplemented with 10% heat-inactivated FCS. Cell suspensions were filtered through 30-μm nylon meshes and washed with HBSS without Ca2+ and Mg2+ (Invitrogen, Karlsruhe, Germany). Renal cell suspension was used for flow cytometric analysis. Isolated cells were stained for 25 min at 4°C with fluorochrome-labeled antibodies specific to CD3 (FITC 17A2; R&D Systems, Wiesbaden, Germany), CD4 (PE GK1.5; Miltenyi, Bergisch Gladbach, Germany), CD45 (PerCP 30-F11; Pharmingen, Heidelberg, Germany), and CXCR3 (PE220803; R&D Systems). Dead cells were always excluded with propidium iodide. Experiments were performed on a Becton Dickinson (Heidelberg, Germany) FACScalibur using the software CellQuest (Becton Dickinson). Mouse anti-sheep IgG antibody titers were measured by ELISA using sera that were collected 8 d after induction of the nephritis as described recently.37 In brief, ELISA microtiter plates were coated with 100 μl of 100 μg/ml sheep IgG (Sigma, Taufkirchen, Germany) in carbonate-bicarbonate buffer overnight at 4°C. After blocking with 1% BSA in TBS, the plates were incubated with serial dilutions of mouse serum (starting at 1:100 to 1:12,500) for 1 h at room temperature. Bound mouse IgG was detected using peroxidase-conjugated goat anti-mouse IgG (Biozol, Eching, Germany) at 1:1000, TMB peroxidase substrate, and absorbance readings (at 450 nm) on a spectrophotometer. Lack of cross-reactivity of the secondary antibody with sheep IgG was demonstrated by omitting the primary antibody. Ig isotypes were measured using the ELISA technique already described. Mouse serum was diluted 1:100 for IgG1, IgG2a, and IgG2b measurement. The bound mouse Ig isotypes were detected using peroxidase-conjugated rabbit anti-mouse IgG1, IgG2a, and IgG2b antibodies (Zymed-Invitrogen, Karlsruhe, Germany) at a dilution of 1:1000. Spleens were aseptically removed from control mice, nephritic wild-type mice, and nephritic CXCR3−/− mice 8 d after nephritis induction. Cells were isolated, and red blood cells were removed by lysis.37 The frequency of IFN-γ–producing cells was assessed by mouse-specific IFN-γ ELISPOT kit (BD Biosciences, San Diego, CA) in accordance with the instruction of the manufacturer. Briefly, splenic cells were cultured at a density of 4 × 106 cells/ml in serum-free X-Vivo 20 medium (BioWhittaker, Walkersville, MD) in the presence or absence of 20 μg/ml sheep IgG (Sigma) in a 96-well nitrocellulose microplate coated with an IFN-γ–specific mAb. After 72 h of incubation at 37°C, plates were washed three times and incubated for 2 h at room temperature with a biotinylated anti–IFN-γ antibody. IFN-γ spot-forming cells were revealed with a streptavidin–horseradish peroxidase and 3-amino-9-ethyl-carbazole chromogen. The number of IFN-γ spot-forming cells in each well was quantified manually with an inverted microscope, and the results were expressed as number of IFN-γ spot-forming cells per 106 cells. Results are expressed as means ± SD. Differences between individual experimental groups were compared by Kruskal Wallis test with post hoc analysis by Mann-Whitney test. Statistical significance was defined as P < 0.05. Experiments that did not yield enough independent data for statistical analysis because of the experimental set-up were repeated at least three times. This work was supported by grants from the Deutsche Forschungsgemeinschaft (PA 754/6-2). We thank M. Reszka, A. Obser, M. Schaper, and U. Kneissler for excellent technical help and J. Scholz for purifying nephritogenic sheep antibodies.